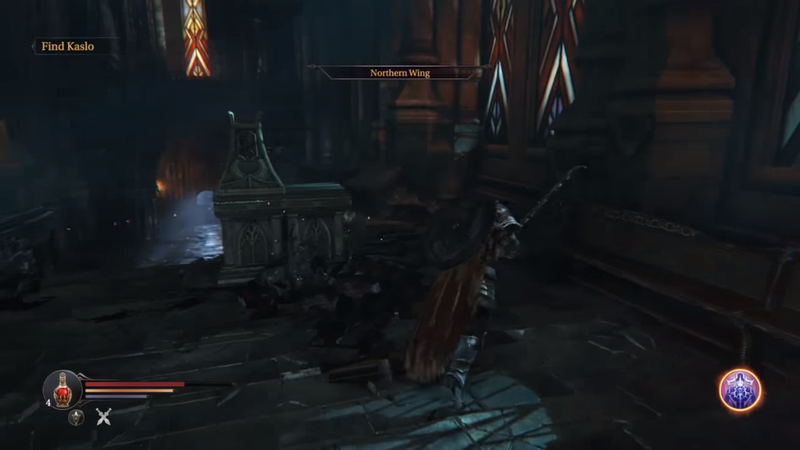 North Wing is a location in Lords of the Fallen. Shortly, after arriving and completing the tutorial on the Marauder the player will find themselves in a room with a large door up ahead. In order to unlock this door the player will need to move into a passageway off to the side of the starting point. Once entering the passageway the player will find themselves face to face with an Infested which they will have to dispatch. Once the enemy has been dealt with the player will need to move forward down the hall, dealing with more Infested as they progress. Eventually coming to a flight of stairs descending downwards here, behind a bookcase that they can break, they will be able to receive an Empty Bottle for health potions. After ascending up the stairs, take a left into a hallway where you will encounter another flight of stairs descending downwards. At the bottom of these stairs the player will once again have to fight Infested before gaining access to the Huge Key. Upon gaining access to the Huge Key, they will need to keep pushing forward until the last flight of stairs is reached. Here you will need to fight against another Marauder at the top of the stairs. Once the Marauder is dead, you will be able to drop from a small cliff back to where Kaslo is located. Here you can fight against the First Warden, for details on how to fight this boss see their own respective page.